Ordinary number signatures Serm-Chot UNC about 83,000 - 88,000 baht. Ordinary number signatures Serm-Chot EF about 44,000 - 46,000 baht. Ordinary number signatures Serm-Puay UNC about 680 - 750 baht. Solid number set 1's - 9's + 000001 + 1000000 (11 notes) signatures Serm-Puay EF about 250,000 baht. Solid number set 1's - 9's + 000001 + 1000000 (11 notes) signatures Sommai-Pisoot EF about 250,000 baht. Specimen signatures Serm-Puay print "SPECIMEN" UNC about 32,000 baht. Specimen signatures Soontorn-Puay print "SPECIMEN" UNC about 26,000 baht. The price was updated on 25th November 2017. The 9th series 20 baht type 5 banknote is identical to the 20 baht type 4 banknote. But the watermark image was chaged to the portrait of King Rama 9. Even though each type of 20 baht 9th series banknote is quite similar, the different points of the 20 baht type 5 banknote are the portrait of King Rama 9 in older of age and the serial number that is printed in black color as well as a security thread. And the watermake image is the portrait of King Rama 9. 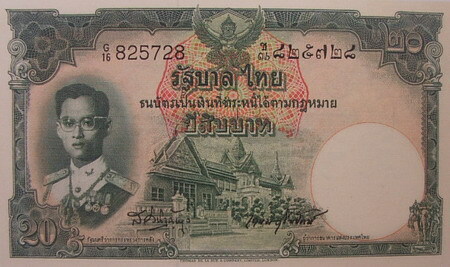 The 20 baht type 5 banknotes were announced on 9th December 1957. The main object is the image of King Rama 9 in older age in the uniform of the supreme. The middle image is Dusidapirom pavilion and Chakri Maha Prasart throne hall. The serial number is printed in black color. There is a security thread. And the watermake image is the portrait of King Rama 9. The main object is the image of the Anandasamakom throne hall. As of January 1st, 1957 the Penal Code imposed more severe penalties for forgery of banknotes. 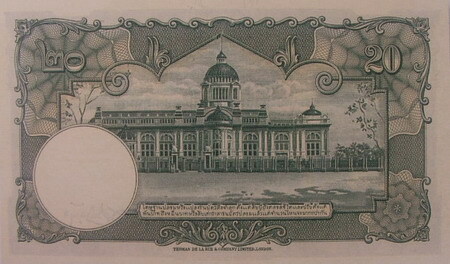 The Bank of Thailand had the statement printed on the back of the banknotes amended to read "The penalty for forgery of banknotes is life imprisonment, or a 20-years term of imprisonment and a maximum fine of 40,000 baht".